The Maze Runner was a decent, albeit muddled attempt at getting the coveted young adult audience interested in another series and its sequel, The Scorch Trials promises more of the mind-blowing storytelling of its predecessor, but is it a success? 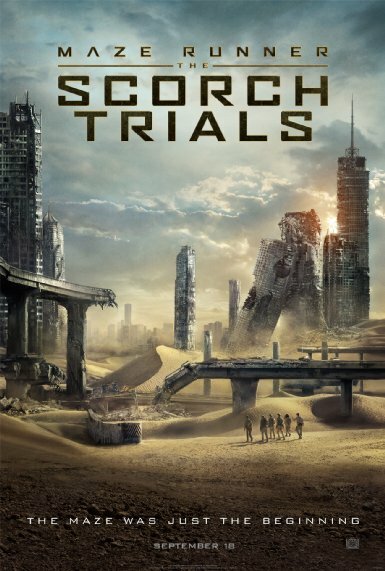 The plot of Scorch Trials takes place immediately after the events of the previous instalment as a group of teenagers battle against the sinister W.C.K.D, an organisation intent on finding a cure for a virus that has ravished Earth. Amongst them is leader Thomas (Teen Wolf’s Dylan O’Brien), the Katniss Everdeen of this particular series, Theresa (Skins’ Kaya Scodelario) and Newt (Love Actually’s Thomas Brodie-Sangster). There are numerous other characters in the group but they aren’t fleshed out enough to make an impact on screen. Unfortunately, character development is a serious problem throughout, with only a handful of the large cast having enough of a backstory to make the memorable. O’Brien is particularly likeable as the confused Thomas and his more reserved persona is a pleasant change to the majority of lead characters in the genre. Of the adult cast, Aidan Gillen does a sterling effort as the mysterious Janson and Giancarlo Esposito is perhaps the best character in the entire film with his portrayal of Jorge – a bargain hunter and ally of the group. A much larger budget has done wonders for the series’ set-pieces. This is a particularly striking movie with numerous heart-racing action sequences filmed with a mixture of stunning CGI and breath-taking practical effects, a desert thunderstorm is beautifully filmed and a particular highlight. The desolate landscapes and ruined cities give the film more than a whiff of Mad Max and I Am Legend with the latter being very similar. These pulse-raising scenes do not do Scorch Trials’ dialogue any good however. The characters don’t get much to say apart from “Run” and “Look out” and the series lacks the powerful communication that The Hunger Games has become known for. Nevertheless, those coming to the series without reading the books will find much to enjoy here as the plot is impossible to guess – there’s simply no way of knowing what is going to happen from one moment to the next. It’s worth noting that this is a very dark film with a tone unlike anything else seen in the genre. The 12A certification given to it seems a little too lenient and in parts The Scorch Trials is deeply unnerving. Maze Runner: The Scorch Trials is, on the whole, a fantastically enjoyable romp in spite of its excessive length and flat characters. It’s not quite up to the standards of The Hunger Games series but surpasses its Divergent franchise counterparts by some margin and is well worth a trip to the cinema.